Acne is a curse that seems to hit everyone, but did you know that it’s not all caused by the same things? 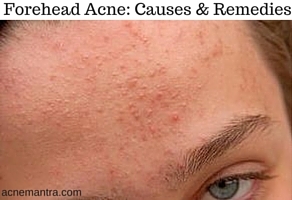 Forehead acne has different root causes than other types of facial acne. Forehead acne can be seen as small bumps on the forehead. It can also appear as cystic acne on the forehead. Although a few of the causes of acne stay the same for all facial acne, you can target the acne on your forehead specifically if you know what triggers it. Acne is tied in to the overall health of your body and mind. If you are having trouble with acne on any part of your face, it might be a clue that there’s something unbalanced inside your body. It is said that forehead acne is caused by liver impurities. You can check out an acne face map to get a good idea about what might be happening in your body to disrupt the pores on your face. It’s long been known that acne can be severely worsened by mental stress. While stress does not necessarily cause acne on your forehead, it will make the situation worse. To read more about the connection between stress and acne, you can read this helpful WebMD article. This is one of the reasons that teenagers are so prone to acne. When your hormones are out of balance, whether you’re male or female, acne can occur. Sometimes these imbalances are due to medications you’re taking as well. Ask your doctor if the medicine you’re on could be making your forehead acne worse. Pimples on the forehead can indicate that your digestive system is having some issues. Digestive stress might be the cause of your forehead acne. Because of the close proximity of the forehead and the scalp, issues with the hair such as dandruff or excessively oily hair can affect your face and give you forehead acne. If the pores on your face get clogged by dirt, dust, or anything else you can get an outbreak of acne and blackheads. When you spray your hair with any sort of styling spray or use a styling hair gel, especially about the front of the hair, you risk giving yourself forehead acne by clogging or irritating pores with the chemical styling product. This is especially true for those with bangs. Irritating the skin can lead to an acne outbreak. If your skin is sensitive to the chemical wash you’re using, it can become irritated and give you worse acne. Additionally, performing an exfoliating routine too frequently can also cause a lot of irritation and outbreaks on your forehead. 8. Dirt from Hats, Helmets, Caps, Etc. Head apparel can collect a lot of skin particles, dirt, dust, sweat, and other things that will most likely end up getting on your forehead and causing acne. Acne is not a losing battle. So many studies have been done on this condition that a lot of treatments have been developed to prevent or clear up acne. Besides treatment products, there are a number of things you can do daily to help get rid of forehead acne. This product line has long been recommended for fighting off breakouts and preventing them from happening in the first place. There are a range of different products here to wash, cleanse, exfoliate, and clear your skin. Neutrogena’s well known acne care line SkinID is great because it takes into account your specific skin type in the treatment. Not all skin is the same, so find your unique skin ID number and pick up the recommended Neutrogena products for it. Although this product does not necessarily prevent forehead acne from appearing, it can clear up your pimples in no time to leave your skin smooth again. A 30 minute exercise session can help relieve stress as well as clean out the pores with sweat. If digestive issues are causing your forehead acne, some simple diet changes can make a big difference. Eat more green, leafy vegetables and make sure you’re getting enough fiber daily. Cut out oily, fatty foods and replace them with healthier and leaner choices. Drinking enough water daily can do more than you’d think for helping your digestion and clearing up your acne. Your face-washing routine may need a change if you are exfoliating too much or using products that your skin is sensitive to. Continue washing your face daily, but don’t exfoliate more than once every 2 – 3 days. Consider switching to a new cleaning product. Masks can do a lot to moisturize and detox the skin on your face, leaving it softer and clearer than before. You can make many face masks on your own with ingredients from the kitchen! Try some of these homemade face mask recipes. If chemical products are making you break out, why not try something more natural? Many natural items can be used as alternative facial scrubs and washes. Try these facial scrub recipes and see if your acne starts to clear up. Dandruff and oily hair can both be combated by a simple change to a new shampoo. Since both of these can be causes of forehead acne, this can be a very effective acne remedy. Your bangs or your hair styling product might be the problem, which means you can consider changes from wearing bangs or else using a different styling method to achieve your daily good looks. Hats and head apparel can get dirty surprisingly quickly. They should be cleaned often so they don’t cause or worsen your forehead acne. Acne doesn’t have to be the bane of your morning any more. Practice some of these simple remedies and watch as your forehead acne disappears!